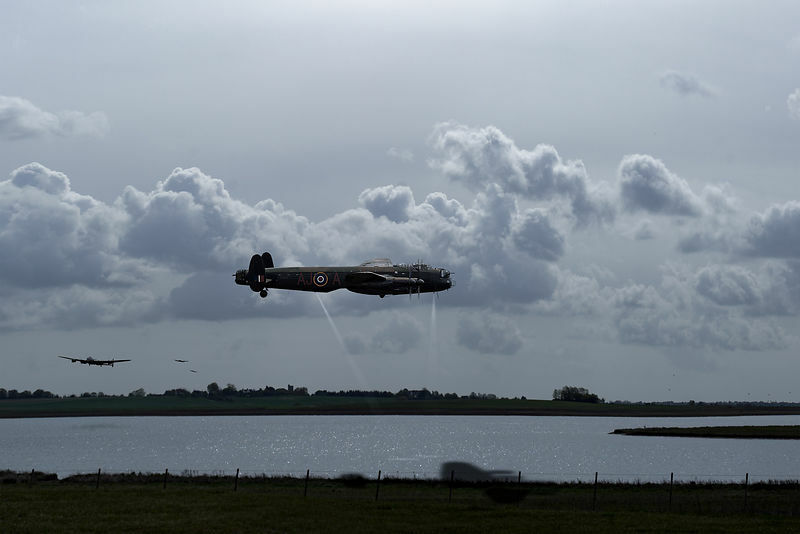 617 Squadron rehearsed for Operation Chastise, the attack on the Ruhr dams in May 1943, by practising on three reservoirs in England in particular: the Derwent, the Eyebrook, and this one - then newly built, Abberton Reservoir in Essex and referred to in the squadron's records as "Colchester Lake". Improbably, given the landscape, it was the substitute for the target at the Eder - which is in steep-sided wooded valleys. The specially adapted Type 464 (Provisioning) Lancaster bombers were flown at just 60ft above the water - purely by eye until spotlights were devised, converging at the correct height. No practice weapons were released, at this or any of the other British reservoirs. There is a lot more about this scene in this blog article.